As well all know, in Hebrew folklore God stepped in at the last second to stop Abraham from killing his son, but Christianity failed to grasp the wisdom of this ancient text, and things really did go downhill. Hence, there’s what can be called the Triple Tragedy of a Human Sacrifice. Actually, this one might not have happened at all. Is it true, in fact, that a first century Galilean peasant preacher got it into his head that he was the “son of God”? And that his destiny was to be put to death, in exchange for which his god would forgive a remnant of humanity? Delusional thinking at this level—and acting it out—is a tragedy. Of course, it’s an absurd scheme on any level, but that doesn’t mean that Jesus didn’t believe it. In the New Testament context, we’re talking about expectations of a “messiah” (anointed=Christ), and folks who have had delusions about being a/the messiah have not been all that rare, as can be seen here. Jesus could have believed this about himself, but did he? We have no way of knowing because his words have not survived. Now please, don’t wave the Bible at me indignantly and protest, “Look, they’re right here!” Because they’re not right there. The gospels were written decades after the time of Jesus, and their authors give no clue about their sources (well, Matthew and Luke copied Mark—which was a bad source); indeed, the gospels look a lot like theological novels. There is no contemporary documentation whatever for any of Jesus’ deeds or teachings—no surprise there: perhaps 95 percent of his listeners were illiterate. And as far as his words being passed on by word-of-mouth, accurately for decades? Accuracy would probably have tanked after just one or two retellings. No, waving a Bible around, with all the Jesus-words printed in red, is useless. Of course, Christianity began as a tiny sect—and remained so for a long time—so we might be tempted to ask, So what if it embraced vicious, repugnant theology? But Christianity turned out to grab major market share on the world stage. So what a tragedy that a major world religion today has, as its centerpiece, a human sacrifice. This course was pretty well set by the time the gospels were written—of course, one of the initial boosts came from Paul’s writings, and from the anonymous author of the Letter to the Hebrews (9:22, “without the shedding of blood, there is no forgiveness of sins”). • “For even the Son of Man did not come to be served, but to serve, and to give His life as a ransom for many” (10:45). The author of John’s gospel, right from the start, draws an explicit parallel with animals sacrificed at the Jerusalem Temple, when he sees Jesus approaching: “Behold, the Lamb of God who takes away the sin of the world” (1:29). “Jesus said to them, ‘Truly, truly, I say to you, unless you eat the flesh of the Son of Man and drink His blood, you have no life in yourselves. He who eats My flesh and drinks My blood has eternal life, and I will raise him up on the last day. For My flesh is true food, and My blood is true drink. He who eats My flesh and drinks My blood abides in Me, and I in him. As the living Father sent Me, and I live because of the Father, so he who eats Me, he also will live because of Me’” (6:53-57). Why don’t Christians throw up? See what happens when theologians get carried away? If Jesus dying on the cross was a real thing, what would have been the harm of honoring him as a hero—as has been the case with countless Christian martyrs? 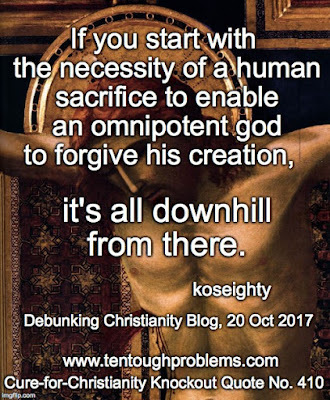 Why add the part about God needing a sacrifice to forgive sins? Why add the grotesque bits about eating flesh and drinking blood? This major world religion should be ashamed of itself. A couple of billion people seem to think all of this is okay. For centuries priests and theologians have worked hard to tame and domesticate a human sacrifice, thus the third tragedy is that this deformed piety has been hardwired into so many human minds, thanks to relentless indoctrination. “The mission was lovely: beautiful landscaping, old buildings, indigenous flowers, a trickling fountain. And then we walked into a large hall—and that’s when my younger daughter lost it. The space was full of crucified Jesuses. Every wall, from floor to ceiling, was adorned with wooden and plaster sculptures of Jesus on the cross: bloody, cut, and crying in pain. Some were very life-like, others more impressionistic. “But all exhibited a tortured man in agony. My daughter had no context to understand it; she had no idea what Christianity was all about and had never been exposed to this most famous killing in history. She just saw what it objectively was: a large torture chamber. And she burst into tears and ran out. “I followed her outside, and once I had caught up with her in the courtyard, she wanted any explanation. But how does a secular parent explain such gore to a five year old? Um, well, you see…there are millions of people who think that we are all born evil and that there is an all-powerful God who wants to punish us forever in hell—but then he had his only son tortured and killed so that we could be saved from eternal torture. Get it? Horrible. Sadistic. Wicked. Please, Christians, try to see the grim imagery of your faith as the little girl saw it—as an outsider. And be honest: if this whole business had been presented to you first as an adult—surely as the ravings of a backwater cult—would you have considered it seriously for even a moment? Yet the folks who arranged the torture-décor would vow, with all their pious energy, that this was the scheme worked out by a loving god to save souls. This is religion at its worst. It’s well beyond bad taste, and—unless there is an evil god—baldly untrue.